Group alleges WoW attempted to sneak Torah scroll in duffel bag into Kotel plaza against police regulations; WoW strenuously deny claims. 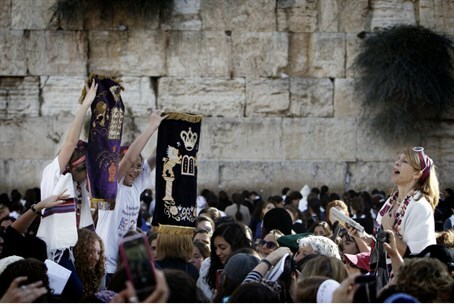 During the monthly prayers held Thursday by the controversial group Women of the Wall (WoW) at the Kotel (Western Wall), group members reportedly attempted to smuggle a Torah scroll into the Kotel plaza in a duffel bag. WoW denies the charges, but acknowledges carrying the scroll in a bag. Police allegedly found the scroll during a routine check of WoW members, and forbade them from bringing in the scroll, citing police regulations that are supposed to prevent theft of public scrolls, not to mention the great tension their public reading from the Torah would cause. According to Jewish law, women are not obligated to hear the Torah reading, and thus are forbidden from making the blessing over the Torah in vain. The smuggling attempt shows a level of disdain for sacred Jewish objects, argues Women for the Wall, an opposition group established to defend Jewish tradition. "We are extremely disappointed that WoW would misuse a holy Torah Scroll in this way," said Ronit Peskin, Director of Women for the Wall. "This is a desecration of something sacred to the entire Jewish nation." Another group was similarly not allowed to bring in a private Torah scroll to a Bar Mitzvah Thursday morning. Unlike WoW, the Bar Mitzvah group did not attempt to smuggle the scroll into the Jewish holy site against regulations and Jewish law. Leah Aharoni, co-founder of the organization, criticized WoW's actions and motives. "WoW's Chairperson, Anat Hoffman, has said that even the Wall itself has no special sanctity to her, but is simply a place of opportunity," noted Aharoni. "Today they have taken it a step further, expressing disdain for sacred Jewish objects, the police, and Israeli civil law in one fell swoop." Back in July, Hoffman wrote an article in the Religious Action Center for Reform Judaism website entitled "support our rally to end the chief rabbinate." After casting various accusations, Hoffman concludes that "it is time to throw out the whole rabbinate." Women for the Wall note that WoW have been provided with alternatives. "WoW has refused to immediately avail themselves of the new Ezrat Yisrael plaza commissioned by Minister of Religious Services Naftali Bennett, or the many Torah scrolls available at that site," remarked Peskin. "Instead it insists upon disturbing traditional practices at the site commissioned for traditional Jewish prayer, and all of us who wish to pray quietly in that fashion." "Today besides their loud singing and general disturbance, they tried to provoke arrest while treating a Torah scroll like hand luggage," added Peskin. "How can they claim to be fighting for the rights of women, when they trample the rights of so many more women to pray undisturbed?" In response to the charges of smuggling a Torah scroll, WoW told Arutz Sheva that they did not try to hide the scroll from security, though they acknowledged that it was stored in a bag. "We entered like everyone else," said a representative from the group, adding "the Torah scroll was held in honor and also in a bag, to protect it on the way." The representative further stated that group members treated the Torah scroll with respect "in full according with Jewish law." WoW argued that public Torah scrolls at the Kotel are only on the men's side, preventing their members from reading at the site in contradiction to Jewish law.